The “Factories of the Future” is one of the three Public-Private Partnership included in the European Commission’s recovery package launched in December 2008 to address the economic crisis. It consists of a research programme of 1.2 B$ to support the manufacturing industry in the development of new and sustainable technologies. The main goal of this initiative is to help European industry to stay competitive and to meet future challenges by converting to a demand-driven industry with higher quality, lower waste generation and energy consumption. The overall motivation is to keep high-tech and low-cost production in Europe and even getting it back from low-wage countries. 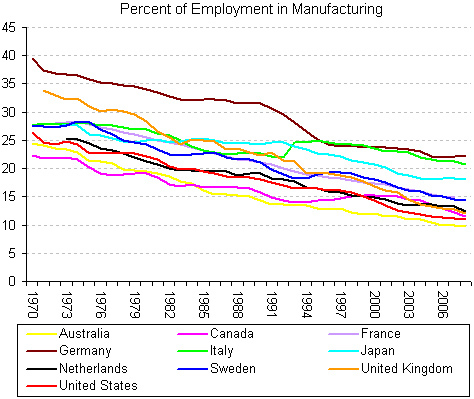 Statistics of the the Bureau of Labor Statistics over the last 40 years confirms the down trend of employment in manufacturing in Europe, USA and Japan. In Britain, for example, the share of employment held by manufacturing has fallen 21.9% in the last few decades, from 33.9% in 1971 to 12% in 2008. But manufacturing is still the driving force of the European economy, contributing over 6500 B€ in GDP and providing more than 30 million jobs. It covers more than 25 different industrial sectors, largely dominated by SMEs, and generates annually 1500 B€ of value added. The long-term shift from a cost-based competitive advantage to one based on high added value requires that European manufacturing increases its technological base and develops a number of new enabling production technologies with cross-sectoral benefits. To cope with increasing demand for greener, more customised and higher quality products European factories will need new concepts, methods and tools for competitive manufacturing. One important component in the factory of the future envisioned by leading industry and research stakeholders in the Strategic mulit-annual roadmap (2010) will be smart, plug & produce, robotic co-workers which collaborate with humans in open and safe working environments. In the minds of industrialists and manufacturing experts effective collaboration between robots and humans is based on the use of an efficient interface whereby a human can communicate and interact with a robot almost as efficiently as he would with another human. This means human-robot collaboration needs to be facilitated by a number of capabilities built into the robot and the robot interfaces, including voice recognition, natural language and gesture understanding, as well as behaviours supporting dynamic autonomy. By aiming to shorten ramp-up times and increase machine availability, the development of intrinsic machine safety concepts for increasing human-robot and human–machine interaction is required for reliable protection for machine operators and maintenance personnel. Some research projects co-funded by the EC to develop new concepts and robotic platforms for manufacturing of the future are listed below. The European automotive industry and their component manufacturers are facing the biggest shift in their history. The transition from combustion engines to electric drives (e-vehicle) requires production facilities that can initially deal with low and varying production volumes and can quickly be up-scaled to large numbers at need. The LOCOBOT research project, coordinated by Austrian research company PROFACTOR, provides a solution to this problem by developing a flexible robotic assistant platform to support manual production processes and increase the productivity and precision of such tasks. LOCOBOT does not only include the robot itself but also the engineering tools that are required for quickly building the robot, setting up its control structure and defining its tasks. The prime objective of LOCOBOT project is to create a tool-kit for low-cost robot assistants built from a set of plug-and-produce kinematic modules with compliant, but precise actuators and intelligent sensing for man-machine cooperation. These scenario-driven systems are socially accepted by the worker. The tool-kit will provide higher flexibility, adaptivity and scalability that are all required to enable greener, more customized and high quality products. The 5,3 M€ project is co-funded by the EC FP7 with 3.7 M€. Forced by challenging and dynamic economic environments European high-end manufacturing industry focus on high flexibility, high quality, reliability and low life-cycle costs and quick respond to changes in competitive markets. The high-end manufacturing industry requests production systems that can quickly switch between diverse machining operations with short changeover, programming and set-up times without compromising quality, reliability or life-cycle costs. Today industrial robots can be used for more precise machine milling for things such as aerospace components. One of the key goals of the COMET research project, coordinated by Delcam PLC Ltd, is to develop an innovative Plug-and-Produce robotics platform that can compete against five-axis machine tools. The consortium including partners from 8 different countries is targeting the moving control optimisation of industrial robots by making use of high qualified equipment and software, scoping on the development of an immediate exploitable platform solution. The 7.7 M€ project is co-funded by the EC FP7 with 5.2 M€. With more than 26.000 companies and almost 400.000 employees footwear industry is still relevant in Europe. However the trend shows a clear decline on business figures; low cost countries are becoming an obvious threat for the future of the sector. European fashion footwear production is currently mainly handcrafted. Some manufacturing processes are assisted by specialized machinery and there exist highly automated lines in mass production of technical shoes, i.e. safety footwear, but most production especially true in the case of high added value shoes production, where Europe maintains its leadership, is still handmade. The 10 partners consortium of the Robofoot research project, coordinated by Fundación Tekniker, will increase the competitivness of the industry by introducing intelligent robotics in highly complex production processes that accounts for some of the shortest production runs to be found- eight pairs of shoes is the average order size. The 3.7 M€ project is co-funded by the EC FP7 with 2.5 M€. The TAPAS research project, coordinated by German robot manufacturer KUKA Roboter GmbH, aims to optimise European production and to prevent manufacturing jobs from migrating to low wage economies by breaking new ground in robot-based automation and logistics. TAPAS is thereby paving the ground for a new generation of transformable solutions to automation and logistics for small and large series production. Future factories will be enabled to engage in more effective and streamlined production, economically viable and flexible, regardless of changes in volumes and product type. The overall objective of TAPAS is to break new ground in robot-based automation and logistics as the backbone of a transformable factory of the future, enabling an economic production regardless of changes in volumes and product type. The 5.2M€ project is co-funded by the EC FP7 with 3.4M€. Driven by the trend to a more and more customer specific production the boundary conditions for assembly automation have changed significantly. As the systems available on the market cannot cover this extreme flexibility towards weekly changing applications new robot system concepts are needed. The concept idea of the PRACE research project, coordinated by German Robert Bosch GmbH, is the dual-arm, mobile robot apprentice, who learns from a human master by instructing certain skills by demonstration. The apprentice robot watches the actions and effects to categorize this newly gathered knowledge into his knowledge base. Then, while applying this new skill, the master corrects the execution by refining the experience. This loop is iterated until the master is satisfied with the result. The trained robot will then operate without safeguards to reach the target of fast setup times and to remain competitive with the human worker. The 4.8M€ project is co-funded by the EC FP7 with 3.4M€. The Thermobot research project, coordinated by the University of Padua, Italy, aims to provide fully automated non-destructive testing in post production and in regular maintenance with the use of thermographic imaging, an automatic path and motion planning model and thermo-image analysis. The 3.5 M€ project is co-funded by the EC FP7 with 2.5 M€. The MiRoR research project, coordinated by the University of Nottingham, UK, aims to develop a fundamentally novel concept of a Miniaturised Robotic Machine (Mini-RoboMach) system, that equipped with intelligence-driven and autonomous abilities, will be demonstrated for holistic in-situ repair and maintenance of large and/or intricate installations. The 5 M€ project is co-funded by the EC FP7 with 3.4 M€. The MAINBOT research project, coordinated by Fundación Tekniker, Spain, will take available wheeled mobile platforms and climbing robots, adapting them to fulfil the industrial objectives of autonomous navigation, mobile manipulation and sensor fusion instantiated in a real industrial scenario. The 3.8 M€ project is co-funded by the EC FP7 with 2.5 M€. The CableBOT research project, coordinated by Fundación Fatronik Tecnalia, Spain, aims to develop a new generation of modular and reconfigurable robotic devices that are capable of performing many different steps in the life-cycle stages of large-scale structures. Parallel cable robots extend the payloads and workspace of conventional industrial robots by more than two orders of magnitude. The main objective is to develop a new generation of modular and reconfigurable robots able to perform many different steps in the post-production of large-scale structures. The 4.4 M€ project is co-funded by the EC FP7 with 3 M€.